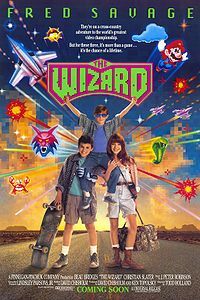 The Wizard poster, featuring Mario at the top-right corner. The Wizard is a film directed by Todd Holland, released by Universal Studios on December 15, 1989, that stars Luke Edwards, Fred Savage, and Jenny Lewis. The movie featured several cameos and direct references to Nintendo-related products, as well as many video games released for the Nintendo Entertainment System. Due to this, the movie has been called a commercial for Nintendo, but has nevertheless gained a cult following. It is also notable for being the first introduction of Super Mario Bros. 3 to North American audiences, and the game is featured prominently in the climax of the film. Super Mario Bros. 3 was referenced in the movie a few months before its release in North America. Super Mario Bros. 3 being played by the title character of The Wizard. Super Mario Bros. 3 is featured as the game played in the final event of the Video Armageddon competition at the end of the film. As the scene progresses, protagonist Jimmy Woods (Luke Edwards) manages to find the Magic Flute in the World 1 Fortress and wins the competition by warping to World 4 (which wouldn't actually score extra points in the game itself; the competition probably has a different scoring system). Curiously, the audience becomes immediately aware of how the game is played, despite the fact that at the time of the film's release, the game would not be available for another three months. Additionally, the emcee at the Video Armageddon announces several level names incorrectly (for instance, calling level 1-3 "World 2"). Super Mario Bros. 2 is mentioned and seen being played occasionally at earlier points in the film. Sound effects from Super Mario Bros. can be heard at a few points as well. Mario was prominently featured in the background of the film's poster artwork (which was later reused as the box art for the VHS and Blu-ray release). This page was last edited on April 6, 2019, at 19:13.